The video test subject represents a video playing object inside the application and allows for testing things around video playback. Video length - the reported length of the video file (in seconds). Video position - the reported position of the play head (in seconds). Video state - the playback state of the video object. One of the following (based on platform): stopped, error, playing, paused, connecting, buffering, finished, idle, preparing, prepared, playback completed, unknown. Video URL - the URL of the video file currently being played. 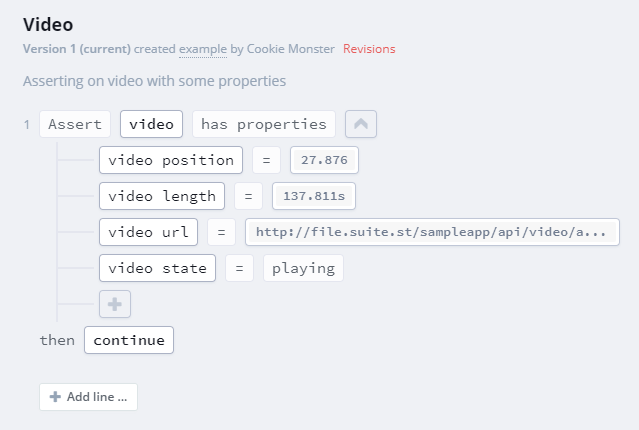 Suitest reads out the video properties directly from the platforms video object bypassing all upper layers like your application framework. Suitest supports the following video objects: HTML 5 video tag, HbbTV broadcast video object, LG Netcast video object, Xbox MediaElement and MediaPlayerElement. There is a great chance that it will work for other video objects as well. In the rare event when the application is internally using several video objects the Suitest video subject may not recognize which from which video object to collect the playback information. In this case store the correct video object in the Element repository and use the View element subject instead. Suitest automatically collects all video properties on most of the supported platforms. However, there are lots of custom video player implementations in the HTML world, so Suitest can't possibly provide support for all of them. You will need to implement all the get* functions above to extract the values from your video object. All returned fields are optional. url - Current playback URL of the video. state - Current playback state of the video. Suitest recognizes the following values: stopped, playing, paused, connecting, buffering, finished, error. Suitest will throw an error if any other value is provided. pos - Current playback position of the video in milliseconds. length - Length of the video being played in milliseconds. Your callback function should be as lightweight as possible, as Suitest will call it sequentially in interval during "Wait until video ..." operations. We recommend that you cache a reference to the video element and it's static properties whenever possible. Our functional example for the Samsung Tizen platform is available in gist.